Are you ready to respond to the biggest challenges facing aged care? Cut through the negative publicity and ensure your organisation is ready for the Royal Commission and the new quality framework. 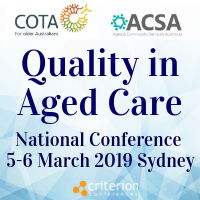 The Quality in Aged Care Conference 2019 is a critical event for all providers of aged care services to take away key insights and information from industry leaders, peak bodies and legislators and prepare their organisations for some of the biggest challenges facing the industry, including the Royal Commission and the new standards.